H Eldawoody, J Mazrou, S Hamad, A AbdelRahman, S Elmogy. The Value of CT Angio Brain for Follow up of Clipped Cerebral Aneurysms; The Impact of Aneurysm Clip Material. The Internet Journal of Neurosurgery. 2018 Volume 14 Number 1. The aim of this study was to evaluate the impact of different aneurysm clip materials on the accuracy and image quality of post-operative CT angiography (CTA) emphasizing the completion of aneurysm obliteration. 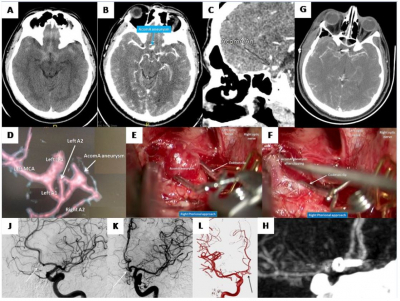 From January 2012 to, Jan 2016; forty-five patients harboring fifty-four cerebral aneurysms with 44 ruptured and 10 unruptured cerebral aneurysms have been treated with open surgical clipping and underwent post-operatively follow up CTA. The results were analyzed regarding the diagnostic yield in view of metallic artifacts with different clip material and at different aneurysm locations. Out of the forty-five cases; 28 patients (62.2%) were treated by titanium aneurysm clips only, three patients (6.7%) with Codman clips only, and nine patients (20 %) with Elgiloy clips (Sugita) only while in five patients (11.1%) different types of clips (mixed) were used. 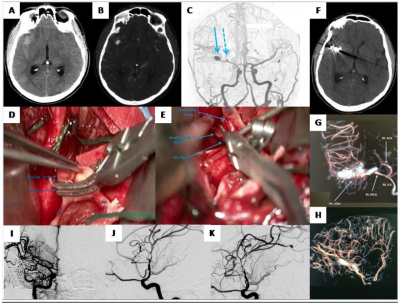 The CTA was informative regarding the target of the study in 37 patients (82.2%) while in eight patients (17.8 %) was none informative either with dense metallic artifacts and/or near the skull base location and so hindering the CTA accuracy in FU of clipped cerebral aneurysms. The Elgiloy and Codman made clips, skull base locations showed less diagnostic yield and even can miss residual aneurysm filling that can be detected only with DSA. Titanium made aneurysm clips showed less metallic artifacts and can increase the diagnostic yield and accuracy of CTA follow up after aneurysm clipping specially when being away from skull base locations. CT angiography (CTA) may provide an acceptable alternative in many cases, particularly for long-term postoperative follow-up. 5,6,7) CT angiography as a non-invasive procedure could be an acceptable and effective technique for the assessment of cerebral aneurysms. The thin collimation used in CT angiography tends to reduce degradation of image from cerebral aneurysm clips. There are also some other artifacts reducing ways: higher kVp (140), mild head tilt, perpendicular clip position to the scan plane, as well as titanium clips rather than cobalt alloy clips. 6-9) The aim of this study is to evaluate the impact of different aneurysm clip materials on the accuracy and image quality of post-operative CTA emphasizing the completion of aneurysm obliteration. From January 2012 to January 2016, forty-five patients harboring fifty-four cerebral aneurysms with 44 ruptured and 10 unruptured cerebral aneurysms have been treated with open surgical clipping. The study was conducted at the Mansoura University hospital; neurosurgery & radiology departments, as well as the Prince Mohamed bin AbdelAziz Hospital, Riyadh, Saudi Arabia. All except one patient were referred from the ER (44 patients 97.8 %) and presented with severe headache and/or disturbed conscious level. They underwent computed tomography (CT) of the brain that showed SAH (ruptured aneurysms). The unruptured aneurysms that have been treated in this study were either a part of multiple cerebral aneurysms, both ruptured and unruptured, and the only patient who was treated as unruptured aneurysm (2.2 %) presented with acute right 3rd nerve palsy. Cases with unruptured aneurysms associated with additional rupture were treated in the same session if they were accessible in the same approach (i.e, AcomA + MCA, AcomA and PcomA, small ipsilateral unruptured M1 associated with large ruptured MC bifurcation aneurysm). The case who presented as an unruptured aneurysm with acute third nerve palsy was treated with clipping. Preoperative CT angiogram of the patient group was found to harbor fifty-four cerebral aneurysms with 44 ruptured and 10 unruptured cerebral aneurysms. 51 of the diagnosed cerebral aneurysms were treated with open surgical clipping. Regarding the remaining 3 untreated cerebral aneurysms, two of them were small less than 3 mm unruptured mirror image MCA aneurysm on the contralateral side of a ruptured MCA aneurysm, and the last one was a distal PCA unruptured small aneurysm less than 3 mm in diameter as well. All patients included in the study underwent follow up CTA post-operatively before hospital discharge. The comparative results were analyzed regarding the diagnostic yield, metallic artifacts with different clip material and at different aneurysm locations. Skull base locations for cerebral aneurysms were defined as those PcomA aneurysms, ophthalmic segment aneurysm, and dorsal wall ICA aneurysms, otherwise aneurysms were defined as non-skull base location aneurysms. CTA was done using Philips 16 and GE 16 machine with helical acquisition, starting from C1-2 till 2 cm below the skull vault, with slice thickness: 0.6 mm,KV:120-140,mA: 750,scanning FOV:25 cm, contrast material: 50 cc with 4ml/sec rate. Images were analyzed regarding: aneurysm remnants (size, shape, wall irregularity and neck), clip location and artifacts, parent vessel state, aneurysms multiplicity, rest of Willis circle vasculature and whole brain state. The data were computerized and statistically analyzed using SPSS (Statistical package for social sciences) version 24. Quantitative data were represented as range, arithmetic means and standard deviations (X±SD), while Qualitative data were represented as frequencies and percents. Chi-square test (χ2) and McNemar test was carried out for calculating significant differences between the qualitative data whenever possible; otherwise “Fisher’s exact test” was used when expected cell is less than five .The result was considered statistically significant when the significant probability was less than 5% (P < 0.05). This study included forty-five patients 23 (51.1 %) males and 22 (48.9%) females, their age ranged between 24 and 73 years old with a mean age of 51.51 ± 12.46 years. 37 patients (82.2%) were diagnosed with single intracranial aneurysm, while eight patients (17.8%) were harboring more than one aneurysm (7 patients with 2 aneurysms, one patient with 3 aneurysms). 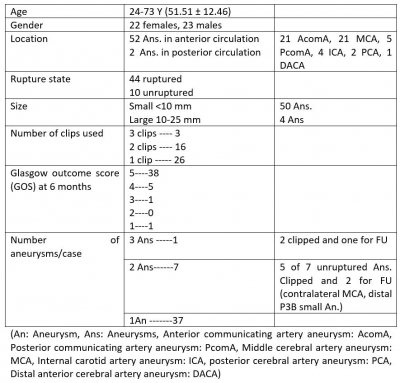 Aneurysm sites were mostly located in the anterior circulation 52 aneurysm and only 2 in the posterior circulation and distributed mainly among both AcomA 21Ans, and 21 Ans in MCA (Table 1). Aneurysm sizes were mainly small (50 aneurysms) and 4 large ones and no giant aneurysms were included in this study. Skull base location aneurysms were 7 (12.9 %) while non-skull base location aneurysms were found to be 47 (87.1%). In this study we used 3 types of different clip materials; the majority were titanium Yasargil design clips 40 in 31 patients, 7 Codman clips in 4 patients,19 Elgiloy clips in 15 patients, Mixed type aneurysm clips were used in 5 patients (table 2). In this study, 66 different types and shapes of aneurysm clips were used. Only one aneurysm clip was used to achieve adequate neck closure in 27 patients (60%), while two aneurysm clips were used for the same purpose in 15 patients (33.3%) and only three clips were used in 3 patients (6.7%). Out of 54 detected aneurysms in 45 cases only 51 of them were clipped among them; 38 (74.5%) aneurysms needed only one clips, 11 (21.5%) aneurysms needed two clips and only 2 (3.9%) aneurysms needed 3 clips. For the three aneurysms that were not treated, one was distal P4 small unruptured aneurysm, and two were small <3 mm mirror image unruptured MCA aneurysms that were left for follow up. CT angiogram was done for all patients before hospital discharge to confirm appropriate clip position, good filling of the surrounding vessels, and the presence of neck remnant if any. Out of the forty-five patients 33 patients’ CT Angiograms (73.3%) were informative regarding the pre-defined target of post-operative CTA while one or more of the predefined targets were missed in 12 patients’ CT Angiograms (26.7%). These finding were different significantly among patients with different aneurysm clips. Out of 38 cases with non-skull base location of clipped cerebral aneurysm 34 (77.3%) of the post-operative CTAs were informative (table 5), while in skull base located clipped aneurysms 4 /7 (57.1%) only post-operative CTAs were informative (P = .2). 44 years old morbidly obese female, known case of hypertension presented by acute severe headache; A: Non contrast CT brain axial cut showed diffuse SAH with intra-ventricular extension into the third ventricle, B: CT angio brain volume rendering transparent formats processed image showed wide neck AcomA aneurysm with dominant left A1, C, D, E, F: Intraoperative photos showing the AcomA aneurysm before and after successful clip application, G: postoperative non contrast CT brain axial cut showed the surgical corridor from right pterional approach and aneurysm clip in position, H, I, J: postoperative CT angio brain showing successful exclusion of the AcomA aneurysm and clearly reconstructed bifurcation; H: Sagittal reformat, I: 3D volume rendering processed image with titanium aneurysm clip in place, J: volume rendering processed image without clip, K, L: postoperative Angiogram, 3D and 2D images confirming stable occlusion of the AcomA aneurysm 2 years after the surgery. 28 years old male, presented by acute severe headache; A: Non contrast CT brain axial cut showed diffuse SAH, B, C, D: CT angio brain axial, sagittal & volume rendering format processed images showed wide neck small pyramidal AcomA aneurysm with dominant left A1, E, F: Intraoperative photos showing the AcomA aneurysm before and after successful clip application at the aneurysm neck, G, H: postoperative CT angio brain showing successful exclusion of the AcomA aneurysm and clearly reconstructed bifurcation; G: Axial, H: coronal reformat processed image with Codman aneurysm clip in place, J, K, L: postoperative Angiogram, 2D left ICA Lat & A-P and 3D right ICA angiogram images confirming stable occlusion of the AcomA aneurysm six months after the surgery. 38 years old male, presented by acute severe headache; A: Non contrast CT brain axial cut showed focal right sylvian SAH, B, C: CT angio brain axial, 3D format processed images showed two right middle cerebral artery aneurysms; one is ruptured large wide neck oblong bifurcation aneurysm and the other is right M1 small unruptured aneurysm at the origin of anterior temporal artery, D ,E: Intraoperative photos showing both aneurysms after successful clip application on both aneurysm neck, G: postoperative non contrast CT brain axial cut showed aneurysm clip in position with significant metal artifact, H, I: postoperative CT angio brain showing significant metal artifacts with Codman aneurysm clip in place at the site of both aneurysms with fairly apparent non filling of the predescribed MCA aneurysms, I, J, K: postoperative Angiogram, 2D right ICA A-P, Lat & working angle images confirming stable occlusion of both MCA aneurysms six months after the surgery. 70 years female, known case of hypertension presented by acute severe headache followed by disturbed conscious level; A: Non contrast CT brain axial cut showed acute right fronto-tempro-parietal SDH with right sylvian and basal cistern SAH underwent emergency craniotomy evacuation of her SDH, B: postoperative non contrast CT brain axial cut showed evacuation of the SDH. C, D:CT angio brain volume rendering and transparent formats processed images showed small wide neck right PcomA aneurysm projecting laterally, E: Intraoperative photo showing successful clip application on the neck of PcomA aneurysm, F, G: postoperative CT angio brain showing significant metal artifacts with Sugita (Elgiloy) aneurysm clip in place at the site of PcomA aneurysm with fairly apparent non filling of the predescribed aneurysm, unfortunately the patient did not show up for post-operative follow up DSA. 63 years old female, known case of hypertension presented by acute severe headache, right hemiparesis, A: Non contrast CT brain axial cut showed diffuse SAH mainly concentrated in the left sylvian fissure, B, C, D, E: CT angio brain coronal, sagittal unsubtracted images and volume rendering formats processed image showed wide neck left ICA paraclinoid aneurysm with small teat at the top indicating site of recent bleed, F: postoperative non contrast CT brain axial cut showed the surgical corridor from left pterional approach and aneurysm clips in position with significant clip artifact, G, H: Intraoperative photos showing the aneurysm before and after successful clip application, asterisk over a proximal control temporary clip on left ICA, dashed line over the neck of the aneurysm, I, J: postoperative CT angio brain volume rendering and transparent reformats showing notable metallic artifacts of the aneurysm clips (one titanium and one Sugita Elgiloy) that did not allow accurate post operative study regarding any residual neck, K,L,M,N: postoperative left ICA angiogram, lateral subtracted and unsubtracted images, A-P and 3D confirming successful exclusion of the left ICA paraclinoid aneurysm two years after the surgery. Impact of number of applied aneurysm clips on the diagnostic yield of post operative CTA. Impact of aneurysm locations on the diagnostic yield of post operative CTA. In this study we evaluated the impact of different clip materials on the quality of CTA images in patients with clipped cerebral aneurysms. CT angiogram was done for all patients before hospital discharge to confirm appropriate clip position, good filling of surrounding vessels, and the presence of neck remnant if any. Out of forty-five patients in this study 33 patients’ CT angiograms (73.3%) were informative regarding the pre-defined target of post-operative CTA while one or more of the predefined targets were missed in 12 patients’ CT angiograms (26.7%). These finding were different significantly among patients with different aneurysm clips. In this study, three different types of clip material were used; the majority was titanium Yasargil design clips 40 in 31 patients (Figure 1), 7 Codman clips in 4 patients (Figure 2,3), 19 Elgiloy clips in 15 patients (Figure 4); mixed type aneurysm clips were used in 5 patients (Table 3). Phantom and clinical investigations showed that artifacts produced by titanium clips on both CT and MR are minor when being compared to the cobalt alloy aneurysm clips. 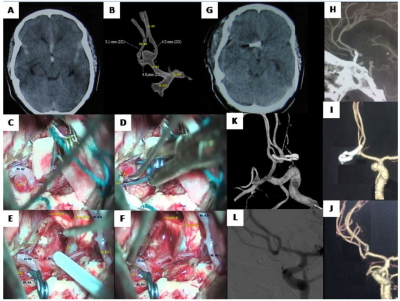 Also, combining titanium clips with Spiral CT angiography (CTA) could be an acceptable mode of post-operative angiographic control and could be applied to determine completeness of aneurysm elimination, adjacent vasculature patency as well as vasospasm.7,20) The currently available cobalt based cerebral aneurysm clips are Phenox and Elgiloy. It is not rare to see image artifacts in computed tomography (CT) and magnetic resonance (MR) imaging leading to failure in delineating the anatomical structures around the clips. 20) Our results matched the authors about the significant artifacts produced by the cobalt clip as well as stainless steel alloy Codman clips which mask the vicinity of the clip in some cases. In this study, out of the 45 patients included in this study, titanium clips alone were used in 27 cases and their follow up CT angiograms were informative in 26 of them (96.2%), while there were only four informative CT angiograms (40%) out of the 10 patients in whom Elgiloy clips were used alone. In patients whom have been treated with Codman clips only one out of three patients (33.3%) was informative. When different types of aneurysm clips used in the same case the diagnostic yield of CT angiograms were informative in two out of five (40%). Our study revealed less artifacts with the titanium clips allowing adequate evaluation of the aneurysm residual, adjacent structures, parent vessels and aneurysm regrowth if present. In spite of the observed tendency of better image quality between non skull base to skull base aneurysm locations, it was not statistically significant (P = .2), but this insignificant correlation might be attributed to the small number of skull base location clipped aneurysms compared to the non-skull base clipped aneurysm locations, or in general small sample number. With technological advances in the multi-detector CT scanners and the use of narrow collimated beam aneurysm clip metal artifact could be significantly reduced and hence gives an opportunity to visualize clearly the adjacent vessels to the aneurysm clips. 11) Not only the CT machine type and protocol are responsible for the degree of aneurysm clips induced metal artifact but also, we think that number of used clips as well as the used aneurysm clips material might have a shared role. Van der Schaaf et al found that the clip site could be viewed in between the streak artifacts in the easiest way using thin-slab interactive multi-planar reformations when the window setting is being wide. Also the volume rendering could help, but maximum intensity projections (MIP) only increase the artifact and hence should not be used in the clip site evaluation. 7) In our study, we successfully reduced image artifacts by multiple ways: MPR usage, increase KVp. We used multi-planar reformat for better evaluation of aneurysm clip status, residual aneurysm and adjacent vasculature. The introduction of 3D CT angiography offers visualization of the intracranial vasculature without the need to perform DSA with its known associated risk potentials. Titanium clips showed significant artifact reduction observed in 3D CT angiography when compared to cobalt or stainless-steel alloys. 7, 20) In our study we had 3D reformat in all the cases, we found that the usage of 3D reformats markedly improved the evaluation of the aneurysm neck, residual (if present) and adjacent structures. Using high kVp in scanning results in less artifact when compared to that with low kVp; however, there is a decrease at higher kVp in the attenuation of iodine- containing contrast, and so arterial enhancement. This drawback could be compensated for by increasing the iodine concentration to 350 up to 400 mg I/mL 7, 23) Scanning patients with 140 kVp and 370 mg I/mL led to a better visualization of the vessels adjacent to the clip site.7) In our study we used higher KV than 120 (sometimes up to 140KVp). The Elgiloy and Codman made clips showed metallic artifacts in CTA more than those with titanium in similar locations; never the less the vicinity to bone (skull base locations) as in PcomA or ophthalmic segment aneurysms both showed less diagnostic yield and even can miss residual aneurysm filling that can be detected only with DSA but yet not statistically significant results. Limitation of the study: limited number of cases, not all the cases could be followed by both CTA and DSA at a time as well as any of them for a long period enough to verify the presence of recurrence/regrowth of cerebral aneurysms, if any. Titanium made aneurysm clips showed less metallic artifacts and can increase the diagnostic yield and accuracy of CTA follow up after aneurysm clipping specially when being away from skull base locations. Many thanks to Dr. Safwat Abouhashem, Assistant professor, neurosurgery department, Zagazig University for his kind help in performing the statistics, and final execution of this manuscript. 1- Wermer MJH, van der Schaaf IC, Velthuis BK, Algra A, Buskens E and Rinkel GJE: Follow-up screening after subarachnoid hemorrhage: frequency and determinants of new aneurysms and enlargement of existing aneurysms. Brain 128:2421–2429, 2005. 2- David CA, Vishteh AG, Spetzler RF, Lemole M, Lawton MT, Partovi S: Late angiographic follow-up review of surgically treated aneurysms. J Neurosurg 91:396–401, 1999. 3- Juvela S, Porras M, Heiskanen O: Natural history of unruptured intracranial aneurysms: a long-term follow-up study. J Neurosurg 79:174–182, 1993. 4- Tsutsumi K, Ueki K, Morita A, Usui M, Kirino T: Risk of aneurysm recurrence in patients with clipped cerebral aneurysms: results of long-term follow-up angiography. Stroke 32: 1191–1194, 2001. 5- Brown JH, Lustrin ES, Lev MH, Ogilvy CS, Taveras JM: Reduction of Aneurysm Clip Artifacts on CT Angiograms: A Technical Note. AJNR Am J Neuroradiol 20:694–696, 1999. 6- Wallace RC, Karis JP, Partovi S and Fiorella D: Noninvasive Imaging of Treated Cerebral Aneurysms, Part II: CT Angiographic Follow-Up of Surgically Clipped Aneurysms. AJNR Am J Neuroradiol 28:1207–1212, 2007. 7- Van der Schaaf I, van Leeuwen M, Vlassenbroek A, Velthuis B: Minimizing Clip Artifacts in Multi CT Angiography of Clipped Patients. AJNR Am J Neuroradiol 27(1):60-66, 2006. 8- van der Schaaf IC, Velthuis BK, Wermer MJ, Majoie C, Witkamp T, de Kort G, Freling NJ, Rinkel GJ: ASTRA Study Group: New Detected Aneurysms on Follow-Up Screening in Patients With Previously Clipped Intracranial Aneurysms Comparison With DSA or CTA at the Time of SAH. Stroke 36(8):1753-1758, 2005. 9- Tomura N, Koga M, Otani T, Nishii T and Takahashi S: Bone-free 3D Computed Tomography Angiography Using an Image-processing Application – Imaging Efficacy for Aneurysms Near the Skull Base and Clipped Cerebral Aneurysms. European Neurological Review 5(1):103–106, 2010. 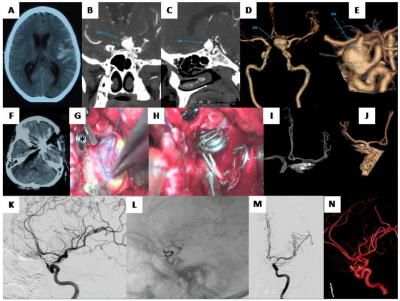 10- Gölitz P, Struffert T, Ganslandt O, Saake M, Lücking H, Rösch J, Knossalla F, Doerfler A: Optimized angiographic computed tomography with intravenous contrast injection: an alternative to conventional angiography in the follow-up of clipped aneurysms? J Neurosurg 117(1):29-36, 2012. 11- Georgieva VB, Krastev ED, Gagov EI, Georgiev ND and Tsandev IS: Multidetector Computed Tomography Angiography in the Follow-up of Surgical Treated Patients with Multiple Intracranial Aneurysms. Journal of US-China Medical Science 12:105-110, 2015. 12- Waugh JR, and Sacharis N: Arteriographic Complications in the DSA Era. Radiology 182 (1): 243-246, 1992. 13- Keedy A: An overview of intracranial aneurysms. Mcgill J Med 9(2): 141–146, 2006. 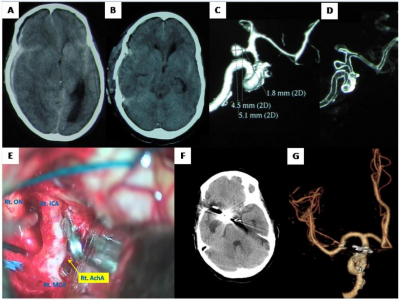 14- Zaher AA, Amer T, AbdEl-Gaber N, Eldawoody HAF, El-Mitwalli A, Gabr W, AbdelRahman AM: The Role of Multidetector CT Angiography In Diagnosis and Treatment Planning of Aneurysmal Subarachnoid Hemorrhage. Egypt J Neurol Psychiat Neurosurg 51(2): 236-241, 2014. 15- Connors JJ, Sacks D, Furlan AJ, Selman WR, Russel EJ, Stieg PE, and Hadley MN: Training, Competency and Credentialing Standards for Diagnostic Cervicocerebral Angiography, Carotid Stenting, and Cerebrovascular Intervention. AJNR 25 (10): 1732-1741, 2004. 16- Budai C, Cirillo L, Patruno F, Dall'olio M, Princiotta C, Leonardi M: Flat panel angiography images in the post-operative follow-up of surgically clipped intracranial aneurysms. Neuroradiol J 27(2):203-206, 2014. 17- Teksam M, McKinney A, Cakir B and Truwit CL: Multi‐slice Computed Tomography Angiography in the Detection of Residual or Recurrent Cerebral Aneurysms after Surgical Clipping. Acta Radiologica 45(5):571-576, 2004. 18- Brown JH, Lustrin ES, Lev MH, Ogilvy CS, and Taveras JM: Reduction of Aneurysm Clip Artifacts on CT Angiograms: A Technical Note. AJNR 20:694–696, 1999. 19- van Loon JJ, Yousry TA, Fink U, Seelos KC, Reulen HJ, Steiger HJ: Postoperative spiral computed tomography and magnetic resonance angiography after aneurysm clipping with titanium clips. Neurosurgery 41(4):851–856, 1997. 20- Steiger HJ, van Loon JJ: Virtues and drawbacks of titanium alloy aneurysm clips. ActaNeurochirSuppl (Wien) 72: 81–88, 1999. 21- Kato Y, Sano H, Katada K, Ogura Y, Ninomiya T, Okuma I, Kanno T: Effects of new titanium cerebral aneurysm clips on MRI and CT images. Minim Invasive Neurosurg 39(3):82–85, 1996. 22- Psychogios MN, Wachter D, Mohr A, Schramm P, Frölich AM, Jung K, Rohde V, Knauth M: Feasibility of flat panel angiographic CT after intravenous contrast agent application in the postoperative evaluation of patients with clipped aneurysms. AJNR 32(10):1956–1962, 2011. 23- Wintermark M, Maeder P, Verdun FR, Thiran JP, Valley JF, Schnyder P, Meuli R: Using 80 kVp versus 120 KVp in perfusion CT measurement of regional cerebral blood flow. AJNR 21(10):1881–1884, 2000.